A production version of the Grand Coupe concept will launch in 2012. MUNICH – BMW will build its Grand Coupe concept car, the company's development chief Klaus Draeger said. The production Grand Coupe will rival luxury coupe-styled four-door cars such as the Mercedes CLS, Audi's upcoming A7 and the Porsche Panamera. The concept was unveiled at the Beijing auto show in April. Draeger said the production version will be positioned close to the 6 series. The new model's technology and price will be aligned with the 6-series coupe, he said on the sidelines of a BMW event in Munich last month. The 6 series starts at 70,450 euros (about $93,560) in Germany. It is still undecided whether the Grand Coupe will get hybrid drive, Draeger said. 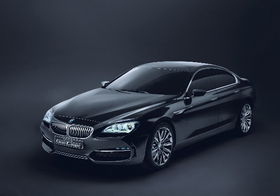 The Grand Coupe will launch in 2012, following the debut of the new two-door 6-series coupe next year. Among other groups, BMW wants the Grand Coupe to appeal to 7-series customers who don't need a chauffeur-driven sedan as they would rather drive themselves.